So as you guys know I raved about Aussie's 3-minute, 3 dollar miracle worker in my hair care post. At first I loved how it made my hair feel and I thought it was doing some serious deep conditioning. I was using almost everyday for a few weeks. I was home in central New York a few weekends ago and got my hair cut with the hairdresser I've had for around 10 years. I was telling her about this Aussie 3-minute miracle and she told me to be really cautious about cheap products like that. She said the chemicals in it could actually really be drying my hair out. I'm such a long time client of hers that I trust her judgement. After she told me this I began to notice that my hair had been looking dryer and more fried. 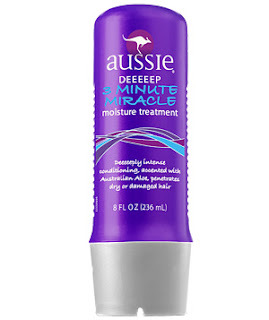 Instead of the Aussie product making it silky and frizz free, it seemed to be doing the opposite. Now, for one, I could have been using the 3 minute miracle too often. I'm not sure how often you are supposed to use it, but maybe using it 5 or so times a week is too much. Two, I cannot say for certain that this product dried out my hair- it was just something I happened to notice. I decided to stop using it all together and I actually have noticed my hair looking less dry. I'm not telling anyone they should stop using Aussie 3 minute miracle, I just wanted to share my experience!! What results have you guys had with this product? !